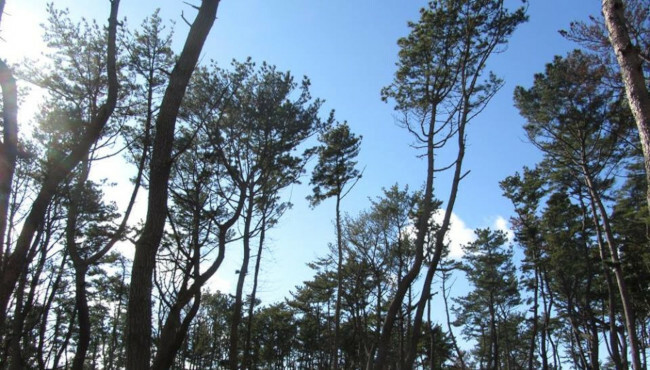 The March 2011 Mega-Tsunami in eastern Japan damaged at different degrees the black pine (Pinus thunbergii) forests along the coast. In order to evaluate the recovery of black pine four years later, tree-ring samples from 9 trees for the period 2002– 2014 were analyzed for ring growth and stable isotopes (δ13C, δ15N and δ18O). The results showed that annual tree-ring width decreased approximately 70 % from the year 2011 to 2014 compared to the period previous to the tsunami (2002–2010). The multiple isotopic analyses showed that the reduction in growth was caused by soil salinity that prompted stomatal closure and an abrupt increase of tree-ring δ13C. Sea water deposition in the soil did not affect tree-ring δ18O values. Two years after the tsunami, decreasing tree-ring δ13C values caused by apparently photosynthetic recovery did not translate into radial tree-growth, indicating a possible shift in carbon allocation to foliage and mainly roots as a defense mechanism to sodium toxicity. The dual δ13C-δ18O model explains neither the limited growth nor the subsequent recovery in δ13C. Similarly tree-ring δ15N indicated that there was no difference in nitrogen availability before and after the tsunami, suggesting that nutrients were not a limitation but rather soil salinity.